Last year, Historic New England implemented a number of small measures to increase energy efficiency at Pierce House, and recent tests show that the improvements have paid off. 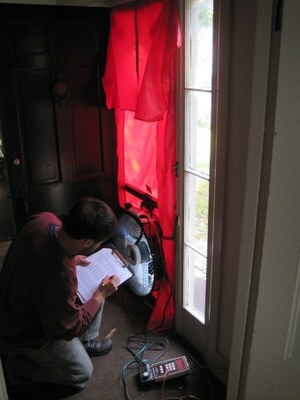 Air leakage is a majorfactor in energy waste. Cold air infiltrates a house and causes the heating system to expend more energy to keep the house warm. In order to reduce air leakage, Historic New England staff re-pointed the foundation of Pierce House and implemented minor, reversible repairs to decrease the flow ofair through the many nooks and crannies found in an old house. We also installed interior storm windows. Repeating the same blower door tests that were performedbefore the project began, we determined that our simple methods reduced air leakage atPierce House by thirty percent. Although we do not have a full year’s worth of data, we are excited about the preliminary results and what they tell usabout simple techniques that homeowners can use to reap big results. Learn more about our efforts to increase energyefficiency at our historic properties. Please consider supporting energy efficiency projects like this or the Lyman Estate weatherization project by contributing to thePreservation Maintenance Fund.